Barry Friedman, M.D. grew up in New Rochelle, New York, graduated Lafayette College and New York University School of Medicine. An interesting and humorous story about how he funded his medical school education can be found HERE. He was commissioned in the United States Naval Reserve in June 1941. 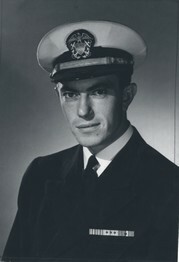 After an internship at Mount Sinai Medical Center in Cleveland Ohio, he was called to active duty as Medical Officer of a destroyer, the USS Russell (DD414). He served aboard the Russell through campaigns in the Aleutians, the Gilbert and Marshall Island invasions, New Guinea, Leyte and Lingayen Gulf actions in the Philippines, and Okinawa. Following his return to the states, he was assigned to the Orthopaedic Surgery Department, U.S. Naval Hospital, Great Lakes, Illinois, where he spent the remainder of World War II. Dr. Friedman received further training in orthopaedic surgery at University of Iowa Hospitals, where he studied under Arthur Steindler, who was known as one of the world's greatest Orthopaedic Surgeon's. After his training in Iowa, Barry Friedman returned to Cleveland, Ohio where he joined the orthopaedic staff at Mount Sinai Medical Center, subsequently becoming Chairman of the Department of Orthopaedic Surgery and Associate Clinical Professor of Orthopaedic Surgery, Case Western Reserve School of Medicine. In 1980, he retired from practice and moved to San Diego, California where he continued as a consultant in orthopaedics and Associate Clinical Professor at University of California, San Diego until his last retirement in 1998. Throughout his career, Barry Friedman, M.D. has been the recipient of numerous awards and honors, including a tribute to his Naval service aboard the USS Russell by the American Academy of Orthopaedic Surgeons called The Legacy of Heroes. In retirement, Dr. Friedman started a new career as an author and has written ten fiction and two non-fiction books and has received awards from the San Diego Book Awards Committee. His last book Survivor, chronicles his experience as medical officer aboard the USS Russell during World War II. Barry Friedman, MD passed-away in 2014 at the age of 97.